Sedimentation is the Unit operation in which the suspended solids in the water are settled with help of gravitational forces. The settled solids are scraped, collected & pushed out of the unit. The unit is called Gravity Clarifier. Basically there are two types of Sedimentations carried out in Biological treatment of Sewage/Waste water. Primary sedimentation is separation of solids before Biological treatment & secondary sedimentation/clarification is the one carried out after biological treatment. The efficiency of the sedimentation results in a significant reduction in the discharge of BOD, COD, heavy metals etc. The bigger suspended solids (Flocs) in the effluent better are settling characteristics. Stokes’ law highlights the importance of the floc size for the speed of sedimentation. D = diameter of the particle in m.
When feeding the clarifier it is possible to facilitate the formation of large flocs by installing baffles inlet that use the kinetic energy of water for agglomerating the flocs thereby increasing size. In the secondary clarifiers is also very important to the type of scraper blade profile and the size of the central well of the collection. Indeed, given the enormous volume of “sludge” with respect to the input flow rate (50%), it can be assumed that the characteristics the mud differ little from those of the clarified water (in static conditions the clarified water and sludge are layered with the surface of horizontal separation), and that then the flocs, due to the slight slope of the bottom (~ 4%), to flow without the need aid to the central well. But it should not be forgotten that the particles that touch the bottom, and by those that are placed on, join and lose the properties of “fluid” must therefore be collected and pushed actively towards the centre well before the layer becomes too thick and gets adhered and especially before the anoxic conditions start occurring leading to denitrification leading to formation of floating flocs. 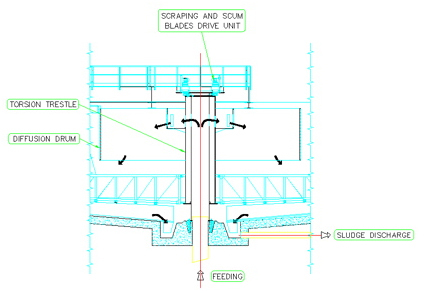 So it may be said that scraper blades should quickly push all the settled solids from the periphery to the centre well. This is achieved by giving the blades a continuous & logarithmic profile. The types of settling that occur in wastewater treatment are summarized in Table below. design, although Types I, II, and IV settling may also occur to a limited extent. The final clarifier must perform two primary functions: clarification and thickening. in a slightly con cen tra ted underflow, or return activated sludge (RAS). 1. Effluent TSS permit violations. retention time (SRT), which could potentially impact the biological process. substrate are available for the desired biological reactions to occur. Also, deep sludge blankets could potentially cause denitrification and secondary phosphorus release as discussed above in design of scraper blades. water rises upward. The upward velocity of water is termed the overflow rate (OFR), and is determined by dividing flow by the clarifier by the surface area. When a clarifier is opera ted at a specified OFR, all particles having settling velocities higher than the operating OFR will be removed , while particles with lower settling velocities will be carried over the effluent weir. By selecting a proper OFR, good clarification is ensured. When the clarifier is not thickening limited (rising sludge blanket), its capacity may be increased by improving settleability. The maximum amount of solids that can be conveyed to the bottom of a clarifier is called the limiting flux. When SLR exceeds the limiting flux, a rising sludge blanket (thickening failure) is encountered. Most design engineers prefer to keep the maximum solids loading rate in the range of 25 to 30 lb/d/ft2. The clarifier solids concentration profile consists of four zones: a clear water zone (h1), a separation zone (h2), a sludge storage zone (h3), and a thickening/sludge removal zone (h4). When the SLR exceeds the limiting flux, the sludge storage zone (h3) expands to accumulate the sludge and limits its conveyance to the bottom of the tank. The continued expansion of h3 will result in the sludge interface reaching the effluent weir, causing a loss of solids (clarification failure). Even flow splitting to allow the full capacity of all clarifiers to be realized. Poor performance of an overloaded clarifier generally can not be compensated by good performance of an underloaded clarifier. Energy dissipating inlets to achieve uniform distribution of flow and enhanced flocculation. Strategically placed internal baffles to minimize short circuiting and density currents. Deep flocculating centre well to enhance flocculation. response to varying operating conditions without causing elevated ESS. It goes without saying that all the above aspects are taken care while designing the Gravity Clarifier System. The Lamella Clarifier & Tube Settler are not truly Gravity Clarifiers since water is forced through the Lamella/Tubes & hence not been discussed here.